People charged with a Foreign Corrupt Practices Act-related offense either cop a plea or fight the case in court. Except for those who choose the third option. They run. If they're living outside the U.S. when indicted, they might plan to never come back. That strategy can only work if they happen to be in a country that won't extradite them, which is harder to predict in practice than on paper. Others have tried to find someplace new that's friendly and beyond the reach of the U.S. Justice Department. But as Viktor Kozeny's uncomfortable years in the Bahamas demonstrate, that's not easy either, even with millions of dollars to make it happen. The first FCPA fugitives appeared in 1982 and the latest this summer. Over the years, plenty have been caught and handed over to U.S. authorities. Others have eventually turned themselves in, deciding a life spent looking over their shoulder isn't for them after all ("Hey there. Small world, isn't it?"). Yet some people facing FCPA charges, including the twelve mentioned below, are still at large, doing whatever they can to stay out of the jurisdiction of the U.S. federal courts. Ousama Naaman, Canadian, intermediary for a U.S. chemical company. Indicted August 2008; arrested July 30, 2009 in Frankfurt, Germany. Now in Germany. Jeffrey Tesler, British, intermediary for Kellogg Brown & Root (KBR). Indicted February 2009; arrested March 5, 2009 in London, England. Now in the U.K.
Wojciech Chodan, British, salesman for a KBR affiliate. Indicted 2009. Location unknown. James K. Tillery, American, executive of Willbros International. Indicted 2008. Location unknown. Edgar Valverde Acosta, Costa Rican, Alcatel’s former senior country officer there. Superseding indictment issued March 2007. Last known location: Costa Rica. Viktor Kozeny, Czech-born, Irish passport, president and chairman of Oily Rock Group Ltd. Indicted 2005. Now in the Bahamas. Pablo Barquero Hernandez, Costa Rican, employed by Owl Securities and Investment Ltd. Indicted 2001. Last known location: Costa Rica. Frerik Pluimers, Dutch, chairman, president and CEO of Saybolt International. Indicted 1998. Last known location: the Netherlands. Rami Dotan, Israeli, air force officer. Indicted 1994. Last known location: Israel. The brigadier-general in charge of Israeli air force procurement was court martialed in Israel in 1991 and convicted along with two others of bribery, fraud, and theft for skimming at least $10 million from jet engine contracts with General Electric in the U.S. He was demoted to private and sentenced to 13 years' imprisonment. Released in 2003. Harold Katz, an Israeli and U.S. citizen, Israeli lawyer. Indicted 1994 (with Rami Dotan, above). Last known location: Israel. Mario S. Gonzalez, Mexican, associated with Grupo Delta, a Mexican corporation acting as intermediary to Pemex. Indicted 1982. Last known location: Mexico. Ricardo G. Beltran, Mexican, also associated with Grupo Delta. Indicted 1982. Last known location: Mexico. With that street-smart aphorism in mind, we went looking for Foreign Corrupt Practices Act-related cases where lawyers were alleged to be on the wrong side of the law. Jeffrey Tesler -- indicted by a Houston grand jury in February. Prosecutors say he was a middleman who handled or arranged corrupt payments from KBR to Nigerian officials. The London lawyer was arrested by British police in March at the request of American authorities, who are trying to extradite him to stand trial in the U.S.
Two American law firms were mentioned in November 2008 during an anti--corruption sweep in China. Avon had disclosed possible FCPA violations involving payments to Chinese regulators. Authorities there were reported to be reviewing foreign investment cases in which the two U.S. firms with offices in Hong Kong and Beijing played a role. The firms (and their lawyers) haven't been named. J. Bryan Williams, a lawyer in Virginia, was an executive at Mobil Oil. He was also a friend of James H. Giffen, an American businessman arrested in New York in 2003 for paying $78 million in bribes to an adviser of Kazakhstan's president and former oil and gas minister. Williams took a $2 million kickback from Giffen for helping negotiate a deal involving Kazakhstan's Tengiz oil field. Williams pleaded guilty in September 2003 to tax charges and was sentenced to 46 months in prison. Giffen is awaiting trial. Hans Bodmer, a Swiss lawyer, represented Viktor Kozeny, the Czech-born fugitive charged with Frederic Bourke with bribing government officials in Azerbaijan. Bodmer was indicted by a New York federal grand jury in August 2003 on single counts of conspiracy to violate the FCPA and to launder money. The court dismissed the FCPA charge, ruling that before being amended in 1998, the FCPA didn't apply to non-U.S.-resident foreign nationals who served as agents of domestic concerns. Bodmer then pleaded guilty to conspiracy to launder money. He's never been sentenced. Attorney Philippe S.E. Schreiber represented Saybolt Inc. It's president, David Mead, said during his 1998 trial that he paid a $50,000 bribe to government officials in Panama only after Schreiber said it wouldn't violate the FCPA. That advice was wrong. Saybolt and Mead were charged with violating the FCPA. Mead was convicted and sentenced to four months in prison, home detention and probation, and a $20,000 fine; Saybolt's FCPA offenses resulted in five-years probation and a $1,500,000 fine. And Schreiber? Saybolt's shareholders sued him for legal malpractice (the case was settled in 2005); and the government never indicted him. Alfredo Duran, a Miami lawyer, was charged in 1989 with arranging a bribe to officials in the Dominican Republic. The government said a $20,000 to $30,000 payment was intended to secure release of an airplane confiscated in a drug case. Duran's co-defendant jumped bail and returned to the Dominican Republic. At Duran's federal trial in Florida on FCPA charges, the court excluded evidence concerning the fugitive co-defendant, resulting in Duran's acquittal. In 1994, attorney Harold Katz was indicted for bribing an Israeli Air Force officer to induce the purchase and maintenance of GE aircraft engines worth $300 million. The bribes, paid into Swiss bank accounts, totaled $7.8 million. A co-defendant was charged under the FCPA, while Katz faced mail and wire fraud and money laundering charges. He was never apprehended and remains a fugitive. That's it, then. Pretty thin record, isn't it? So the verdict on Mr. Puzo's wisdom about that briefcase? 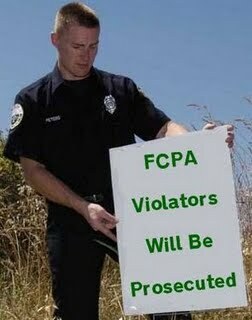 Well, either he's wrong when it comes to the FCPA and lawyers aren't the culprits after all. Or he's right and they don't get caught.